Bleurgh! Blocks, everywhere! Please, not another frickin’ LEGO game?! Of course it isn’t, we’re just being dicks, for the clunkily named 3D Dot Game Heroes may be blocky, but it’s a paean to the graphics of classic games of the ‘80s. You know, the days when the technology meant that big obvious pixels were the best you could get and everybody dreamt of the sort of graphical oomph we have nowadays. No, the irony’s not lost. It makes for a peculiar clash, as characters that look like they were nabbed from a 3D Tetris receptacle ponce around the forced 3D kingdom of Dotnia, which, save for obvious interacty things, is mostly kind of all smooth. The player’s tasked with controlling our wee blocky hero, who wields one serious mofo of a sword as he battles through screen after screen after screen after screen of slashable objects. He’s out to stick it up evil old Dark Bishop Fuelle by yoinking back the orb he’s pilfered that brings peace to Dotnia. You get it, right? 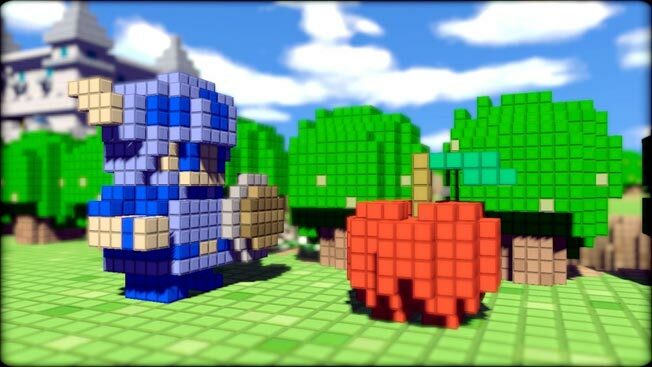 3D Dot Game Heroes does the retro lovin’ RPG thang with tenderness and care – and more in-jokes than an episode of 30 Rock. It’s essentially a Legend of Zelda rip… erm, tribute, and it’s done well, save for some annoying delays between screens and frustrating grinds to find stuff needed to progress to certain areas. Also, it may look unassuming, but it has some bitchbastich bosses to overcome. Retro nuts will dig this majorly – there’s even a playable character called ‘SantaFunk’. Just like the towels in Joe’s Apartment, he’s got the funk. Oh yeah baby!